When Hurricanes Irma and Maria slammed into Puerto Rico, they left behind a trail of destruction and all the humanitarian needs you would expect: food, water, shelter, first aid. The storms also knocked out power for the majority of the islands’ residents—who found themselves unable to connect to wifi, make phone calls, or even charge their mobile devices. The three simple words, “I am alive,” can bring peace of mind after disasters. But after Hurricanes Irma and Maria, Puerto Ricans had very little opportunity to impart that crucial message to family members outside of their own neighborhoods. Connectivity isn’t often spoken about as a humanitarian imperative, but to people worried about the fate of their loved ones, it’s as essential as food and water. To meet this need, our Red Cross teams are taking mobile hotspots on some aid routes in Puerto Rico. Alongside relief supplies like drinking water, we have been able to provide Puerto Ricans with a way to connect with loved ones, inform family members of their safety, charge their phones, and access information on the internet. Our teams continue to see tears of relief and joy as people reconnect with mothers, fathers, grandparents, and siblings. “We’re really grateful because I was very emotional after being able to talk to my daughter,” said one woman from the city of Ponce. During disasters, we are eager to get our hands on any data that may help us distribute aid to people in need. It helps us sharpen the essential tools we need to deliver relief—like reconnection services—in disaster zones. One of the key datasets informing our family reunification efforts was provided by Facebook. In June, Facebook began sharing aggregated, anonymized information with the Red Cross and other humanitarian organizations about where people on Facebook were located, moving, and checking in safe after natural disasters. After Hurricane Maria, this data was an important layer in helping the Red Cross to identify population centers in need of power and connectivity. We compared historical mobile activity with post-storm activity in order to use Facebook’s aggregated data as a sort-of connectivity map of where people had power (and with it, the ability to charge phones and reach the outside world). The first few days after our roving hotspots arrived in Puerto Rico, Red Cross teams drove through areas we knew had limited or no connectivity. And bingo! Families used the free internet access to connect with loved ones. Since most of the island was without power, it wasn’t difficult to identify people in need. On the fourth day, teams arrived at a town whose 4G connectivity had come back. So while more than 100 people appreciated what the hotspots had to offer, we didn’t reach the maximum number of people in need of connectivity. We used Facebook’s aggregated data as a sort-of connectivity map of where people had power. That night, our teams decided to pair Facebook’s data sets with information from the Center for Disease Control’s (CDC) Social Vulnerability Index. The Facebook data helped us find places where people may have lost connectivity, and CDC’s index helped us identify communities that may need support in preparing for hazards, or recovering from disaster. Taken together, these datasets allowed the Red Cross to see exactly which population centers were most likely to need connectivity and relief supplies. The next day, our teams helped more than 1,000 people connect via our mobile hotspots in a town called Naguabo. 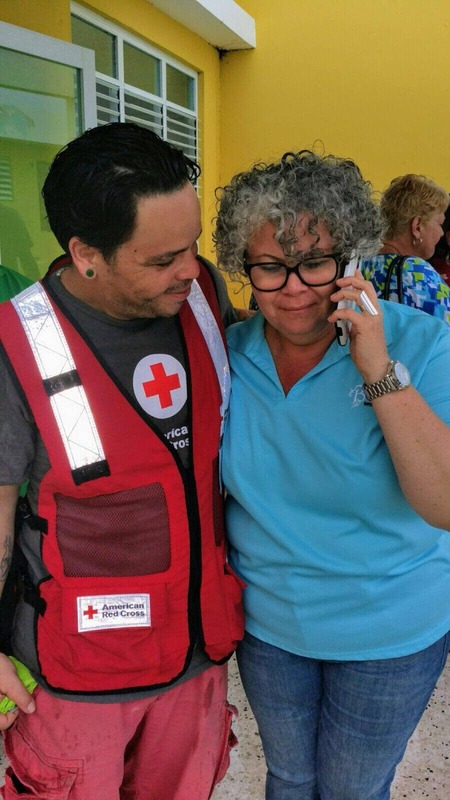 “Witnessing people shed tears of joy when they connect with their loved ones has been the highlight of this mission,” said Colin Chaperon, American Red Cross’s Emergency Field Operations Lead, who recently returned from Puerto Rico. That’s a true testament to the power of data. The Red Cross has been helping loved ones separated by disaster, crisis, and conflict reconnect for more than 100 years through our Restoring Family Links project. Thanks to technology, the hardware we’re able to bring to disaster zones, and the wealth of data at our fingertips, this type of humanitarian aid continues to evolve—bringing along with it hope and relief for families around the globe. Red Cross volunteers set up a mobile hot spot in Puerto Rico after Hurricane Maria. As I sit in my living room here in Montana reading about the awesome work fellow redcrossers are doing in areas damaged by these hurricanes, I feel a sense of pride that my team mates across the country are doing what we as redcrossers do. Helping Aleve human suffering in their time of need. I volunteer with a young US Air Force F-15 avionics technician who has family in Puerto Rico. I know that she is doing her part from Idaho to also help families across the world by her volunteerism from Idaho. To know some of the work we do locally can have an impact on families all over the world brings a great sense of pride to our mission to help alleviate human suffering. I love being a volunteer for the Red Cross of Montana and Idaho.